What are the first and second reminders? First and second reminders are messages that we send to your customers in order to remind them about carts they abandoned on your store. Are these messages sent automatically? If the abandoned cart messages feature is turned ON, then the first reminder will be sent by defaults one hour after user abandons the cart. The second reminder will be sent 23 hours after the first one is scheduled, it can be on by default or only if user asks to receive second reminder. If the "Send only to people who opt-in for a reminder" option is not checked then the second reminder will always be sent 23 hours later except in the case where the user unfollows and turn off notifications. Can I customize these messages? Definitely, we encourage you to customize these messages and personalize them for your store. Here is how you do that. You can add it by creating a discount code on Shopify and add code and offer in First and/or Second reminder. 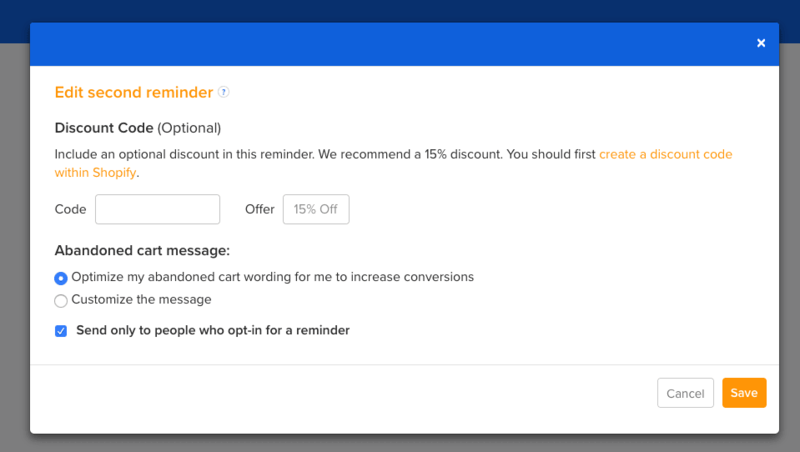 In our experience adding a discount code increases conversions.